These Are the Voyages… aired in May 2005. Star Trek has been off the air for almost a decade; longer in the eyes of certain fans who have their own earlier cut-off dates. Although JJ Abrams brought Star Trek back to the big screen, it is not quite the same. It is not simply that – as Ronald D. Moore has argued – Star Trek feels more at home on the small screen. There is also a sense that there is a dearth of “new” stories in the Star Trek universe. One two-hour movie ever three years does not cut it, after all. A whole cottage industry has developed around trying to sate Star Trek fans – to deliver the new episodes that it seems so many fans so desperately want. There are month comic books set within the continuity of the recent movies. There are novels that unfold in a loosely serialised format building off the end of the various twenty-fourth century shows. There are numerous fan projects churning out their own new Star Trek stories, whether featuring the original characters or a novel twist on the franchise. This desire for new Star Trek is understandable. Given the rate at which the franchise was produced during the nineties, it is hard to imagine living in a world where new Star Trek arrives by drip-feed. In a way, John Byrne’s New Visions series is the most candid attempt to cater to this impulse among Star Trek fans. 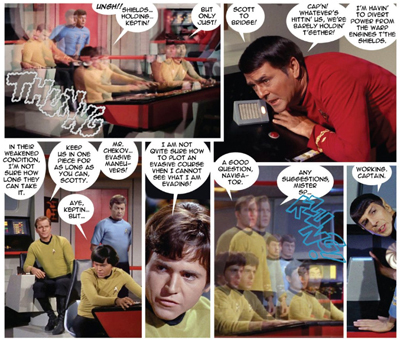 Using a wealth of images from the original Star Trek series, some photoshop skills, and years of experience writing comic books, John Byrne is literally able to stitch together new stories from the eighty classic Star Trek shows. It is a bizarre blend of storytelling and cannibalism that serves as a fairly cynical metaphor for a particular approach to tie-in Star Trek material. The desire for “new” Star Trek is somewhat paradoxical. There is a very strong market for a certain type of “new” Star Trek material, material that reflects and reinforces particular aspects of the franchise, that operates within certain parametres and satisfies certain expectation. Indeed, John Byrne himself has been quite candid that he grew up with the classic Star Trek and that he was never particularly fond of the various spin-offs and reimaging of the franchise. So the “new” Star Trek that John Byrne wants falls within a specific template. New Visions satisfies that particular desire for Star Trek, cutting up old episodes and piecing them back together to form something that is both new and familair. It is no coincidence that two of John Byrne’s three New Visions comics open immediately following the credits of a well-loved episode. The Mirror, Cracked opens immediately after the end of Mirror, Mirror and Cry Vengeance opens almost as soon as the credits have started rolling on The Doomsday Machine. These are not so much new stories as continuations of old stories. While there is a great deal of fun to be had playing with these big concepts, one does have to wonder what more needs to be said about the eponymous planet-eating machine from The Doomsday Machine. John Byrne is far from the first to use the devise a story around the behemoth. Peter David had written the monstrosity into Vendetta, his “giant-sized novel.” However, Cry Vengeance really has very little new or exciting to say about the machine, introducing us to an alien ship that travelled the universe in order to attempt its vengeance upon the device. In the process, Byrne confirms the story suggested by Norman Spinrad in his script. It turns out that the organism is the last relic of a long-dead civilisation, a weapon of mutually assured destruction unleashed upon the universe that just kept going once it had completed its original task. “It was programed to utterly destroy the enemy’s homeworld,” we are told. “Which it did. But then it returned to its origin point… and instead of deactivating as intended…” We see the destruction wrought by the entity. However it is worth asking what the point of this all is. What do we learn from Cry Vengeance? 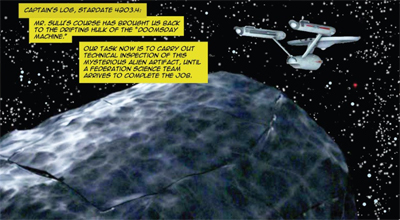 What does the story say that The Doomsday Machine does not articulate already? Cry Vengeance cannot help but feel like a re-heat of a classic episode, one that provides the reader with very little insight or novelty. Instead, it seems to exist primarily to articulate what was left implied by the original script. This is a very safe, very conventional approach to Star Trek. It seems to exist not to expand the universe, but just to reassure fans. There is something quite unsatisfying about this approach to Star Trek, where tie-ins seem to exist primarily to re-tread old and familiar ground. This conservativism can be seen in the tie-in comic book and the novel as well, where stories seem to play it safe. There is little interest in telling new stories with new settings and new characters. Instead, the focus remains on what the reader already knows – offering more of what came before, more “new” material that seems to exist primarily to repeat what has already been said. That is not to suggest that there isn’t good work being done. Indeed, John Byrne is a competent storyteller who knows Star Trek and who knows how to structure a comic book story. His work for IDW Publishing is of a consistently high standard, but it does feel like it is operating within very rigidly-defined boundaries. There is a very clear conservatism to the production of these tie-in materials. For a franchise built around going “where no one has gone before”, it all feels a little safe. It is interesting to compare the tie-in materials published in the twenty-first century to the tie-in materials published during the last great “drought” of televised Star Trek. In the years since These Are the Voyages…, where are all the new tie-ins on par with The Final Reflection or My Enemy, My Ally? Where are all the interesting and eccentric tie-in materials like the FASA role-playing game? These were stories that really pushed the boundaries of what Star Trek could be. It is hard to think of any contemporaneous tie-ins that measure up. This is probably down to differing commercial realities, with a tighter control of the license and more source material upon which to draw. More than that, one suspects that these tie-ins are the product of years of experience and research. These companies know what will sell, and it seems like perhaps contemporary fandom is more likely to invest their hard-earned cash in something familair and recognisable rather than something provocative or novel. Still, even allowing for these considerations, it remains a little sad. There is a deep and disappointing irony that a lot of what counts as “new visions” are really just old stories cut up and stitched back together. I still have respect for John Byrne’s more recent work despite his rather vile statements but the New Visions series has been quite disappointing, both because of the clumsy photo art and because their themes and statements seemed outdated. It’s pretty difficult to write for an older franchise, emulate the style too well and it seems stale, push too much in another direction and it doesn’t “feel” like a TOS story. However, it feels like Byrne’s on autopilot for these stories, putting together very generic 60’s sci-fi plots and themes and producing something that just isn’t that interesting or innovative. It doesn’t even appeal to my nerdish nostalgia because it feels more like generic sci-fi than old school Trek. It’s the Borg that gets me.